As alluded to in earlier issues, low volatility did not last and investors saw a turbulent start to February with bonds and equities both selling off, with markets blaming algorithmic traders and low volatility funds for exacerbating the situation. In this issue, we put the recent falls in equities and market volatility into context. Early February saw volatility finally return after a year of hibernation, and a sell-off engulfed both equities and bonds. The initial trigger was US wages beating expectations, driving up inflation expectations to force bond yields higher, and bond prices lower. The US 10 year government bond yields are now trading around 2.9%, significantly higher than the levels it was trading at six to nine months ago. The S&P/ASX 200 index fell nearly 5% within two days and has now retraced below the 6,000 point mark. US equities felt double the pain, with the S&P 500 tumbling close to 10% in early February. Meanwhile, the European Stoxx fell over 7% and the Nikkei was down over 10%. This all happened in the midst of an earnings season that has so far shown higher than expected earnings on already elevated expectations, and buying quickly returned to the fore fairly quickly to stabilise the equity markets. Given the Australian Dollar’s reputation as a risk-on currency, the AUD duly fell back below 80 US cents. Economic growth continues to show strength across most countries. Employment in Australia has maintained its strong momentum as employment numbers beat expectation, with participation stronger than expected, indicating that many previously discouraged job-seekers are now seeing opportunities and are returning to the workforce. The AIG Australian Manufacturing Index continues to indicate expanding economic activity. However, domestic retail sales and consumer confidence remains mixed as strong readings last month was followed up by weak readings this month. US data remains robust as employment figures and wage growth were both strong, forcing yields higher and sparking a bout of volatility in investment markets. Manufacturing and services surveys also continue to indicate that growth is likely to continue. Inflation figures were also higher than expected and with core inflation at 1.8%, very close to the Federal Reserve’s 2% target, there has been talk of the possibility of four rate hikes this year. However, this was balanced with weaker than expected retail sales figures, indicating that consumers remain tentative on spending despite elevated confidence levels. Europe continues to recover to expectations, and like the US, employment data and activity surveys remain robust. The latest inflation reading of 1.4% also continues to move towards the European Central Bank’s target of 2%, bolstering the case for eventual removal of accommodative policy. Meanwhile, China continues to defy expectation of a slowdown as GDP beat estimates at 6.8% for 2017, and early figures in 2018 indicate that China could continue to beat expectations as economic activity surveys and industrial production readings came in above expectations. This affords China further room to manage the reduction of its huge debt load without too much fallout. Moving forward, the market will be monitoring the results of Jerome Powell’s first Federal Reserve meeting as Chairman next month, with a 0.25% rate hike expected. Inflation inputs such as wages, consumer spending and confidence will be closely watched by the market as well. There has been a lot of focus and commentary about the recent market falls and spike in volatility, with blame being lobbed around from inflation to algorithmic traders to low volatility investors. It was probably a combination of all plus some additional factors all coalescing to force large moves in equity and bond markets in a short span of time. Despite all the hype around the market movements, this sort of movements has perforated throughout history as shown in the table below. For several years, the market has been obsessed with the ‘new normal’ (a low volatility, stable return environment) as global central banks flooded the market with liquidity through low or negative interest rates coupled with large and aggressive asset purchasing programs, commonly known as Quantitative Easing (QE). Market participants saw the Federal Reserve as a put option, which means that they relied on the Federal Reserve (or another central bank) to buy assets from them at the first sign of trouble to create a floor for asset prices. This effectively drove volatility lower and eventuated in 2017, one of the calmest, if not the calmest period for investors. Last year, the Federal Reserve started regularly raising rates and reversed its asset purchasing program by starting to let some assets roll off its balance sheet at maturity and not reinvesting the proceeds, commonly termed Quantitative Tightening (QT). Although other central banks continue to buy enough assets to continue to inject liquidity on a net basis, the fall in net purchases is akin to a lower put strike price. The net purchases for central banks is expected to turn negative later this year as the Federal Reserve steps up its QT program and other central banks reduce their purchases. Given this, it is not surprising that market volatility rises back to the ‘old normal’, as the conditions that drove the ‘new normal’ subside. The previous Federal Reserve Chairman, Janet Yellen, even used the term ‘Policy Normalization’ to describe the journey back to a higher interest rate environment without QE support. As we alluded to in our August 2017 issue, a low volatility environment cannot persist forever and was bound to return. While it is unclear whether the recent equity market falls were just a correction or whether it will eventuate into a bear market, it is worth exploring what this means for investors moving forward. A correction is generally used to term falls between 10% and 20% from the peak. 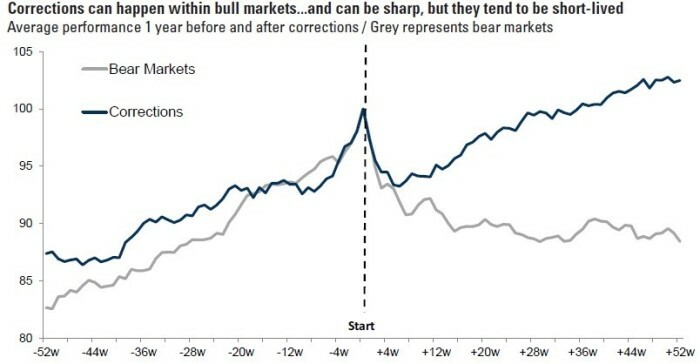 Corrections are generally short-lived and make a regular appearance in longer-term bull markets, with market participants generally viewing corrections positively as a healthy pause before another leg up, or an opportunity to buy. Bear markets are generally used to term falls over 20% from the peak and generally take longer to recover as they tend to coincide or pre-empt recessions, financial system instability, or structural issues that need to be rectified. The chart below portrays the average difference between corrections and bear markets. As per the chart, the average correction tends to recover within a few months while the average bear market tends to take nearly two years (not shown on the chart) to reach its previous record high. The recent fall was not triggered by fears of recession, a slowdown in earnings or an external shock, and corporate spreads that indicate the balance sheet health of companies remain strong. Given that the current economic environment of synchronised global growth does not look like slowing, coupled with strong earnings growth across global equity indices, the consensus view is that the recent falls are a correction rather than the start of a bear market. As prices have fallen in conjunction with rising earnings, equity valuations have become more attractive, and common measures such as the forward price/earnings ratio of the indices have moved closer to historical averages. This has led to many well-known market strategists advocating for investors to buy the dip. 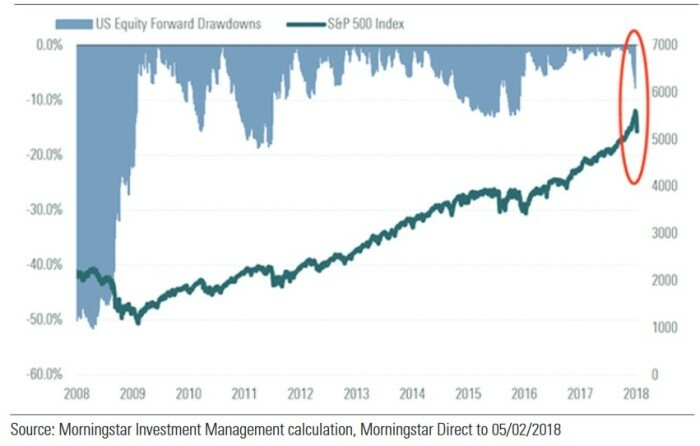 While the fall does provide some opportunity, investors should remember that equities have come a long way over the past 10 years, as the chart below shows. Therefore, despite this opportunity to increase equity exposure, investors need to be disciplined and mindful of taking on too much risk by over-allocating to equities, and should continue to employ appropriate risk-aligned portfolios that take advantage of the benefits of diversification.